+30% On-Time Deliveries: Can Predictive Analytics Be Easy? Everyone knows you can make big improvements to supply chain metrics like on-time delivery with predictive analytics. But can you leverage predictive analytics with zero data skills? Without the hassle of learning new software? Can you make big gains quickly and painlessly? Attend this live webinar to see what's possible. Emily helps companies understand how new data technologies can solve their biggest challenges. In-house and agency-side, she's spent nearly a decade helping brands use data to make smarter decisions and optimize KPIs. Content was good but on-line webinar connection was terrible. Like the 2 way dialogue and the easy logical flow of the subject matter. The slide content was really good too. 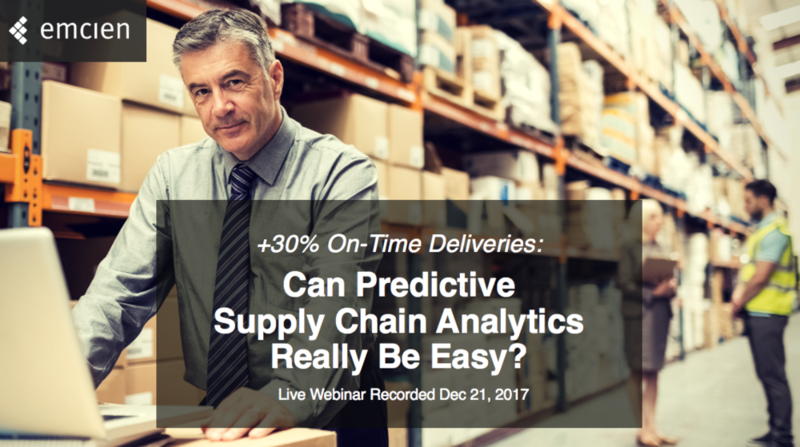 Everyone knows you can make big improvements to supply chain metrics like on-time delivery with predictive analytics. But can you leverage predictive analytics with zero data skills? Without the hassle of learning new software? Can you make big gains quickly and painlessly? Attend this live webinar to see what's possible.